i've got these 2 non-workers coming in. could only find 1 or 2 pictures on the net from the golden one...is this one so rare? Do someone have a link how to do first aid to see what the problem could be? Hi Kasper, not that rare I would believe, the golden one is a 214H likely post-1975 model with hacking. 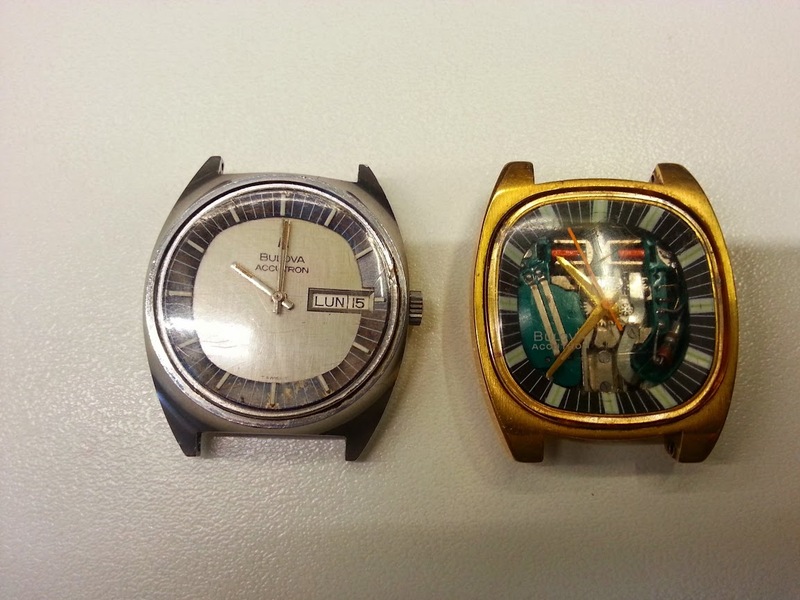 the steel one might be a 218 but it might also be something different or even an early quartz prior to changing to AccuQuartz branding. the first golden rule with any accutron is to tap it after inserting a battery. You'll need a 387S battery (comes with a plastic sleeve) for the 214. If it hums, you'll know the coil and associated circuitry is working. @ Piotr : Who is Rob? I love my Accutron and it's quite a lot more accurate than most of my vintage Casio digitals!